Display Your Precious Memories in your Home! 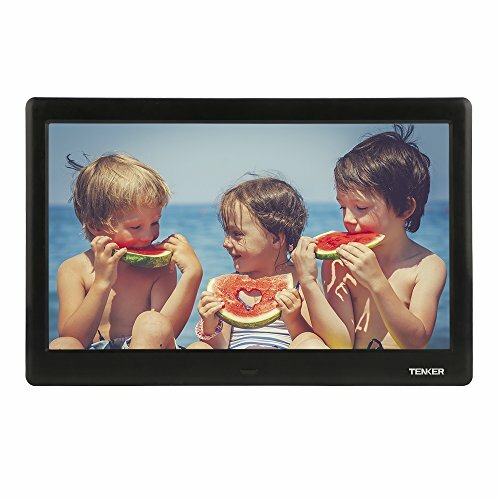 TENKER is a well-known, experienced digital photo frames brand with expertise in research & development, sales and #1 after-sales service. Our digital photo frames are the perfect gift for you to share your memories in your home. It’s convenient for other media uses as it can also play video and music too. Continual improvement, upgraded firmware and strict testing guarantee a great user experience. You can purchase from us with confidence as we provide a 1-year warranty and professional after-sales service and technical support! This digital photo frame can adjust your photos automatically the orientation of your photos. You can play photos with background music in the same slide shows for a fantastic user experience! Plug-and-play: With no required setup and no software to install - just turn it on. Supports USB drives, MMC, SD, MS, SDHC (up to 32G). The hidden control on the back and the remote controls are so easy to operate, anyone can do it! Note:This frame's storage is 8MB, you need a SD card or a USB drive to play your photos or video and etc.